Nadya is the Head of Marketing at Venngage and has written for and been featured in publications such as Forbes, The Next Web, Huffington Post, Entrepreneur, Mashable, Wired, and CBC News. When not at Venngage, she spends much of her free time drinking and contemplating her existence. In an effort to transform her unhealthy hobby into a productive project, she decided to start Drunk Entrepreneurs, a web-series where she drunkenly shares marketing advice with whoever is depressed enough to watch. I started out doing a theatre degree, but in terms of leadership generally, I was really into directing plays and productions in high school. During my undergrad, I directed our program's final production, which really gave me an opportunity to work collaboratively with a lot of strong personalities. After completing my master's degree, I started at Venngage as a marketer and eventually shifted into the Head of Marketing position. Management took a while to fully grasp and understand—the biggest struggle was taking a step back from the day to day and actually having to focus on strategy and delegate to other people on the team. My main takeaway was (and still is) that you need to be able to trust others on your team, and understand that mistakes happen, but that's okay because it's how people learn and grow. Rather than scolding people for making mistakes, you need to nurture them and help them learn from their mistakes. 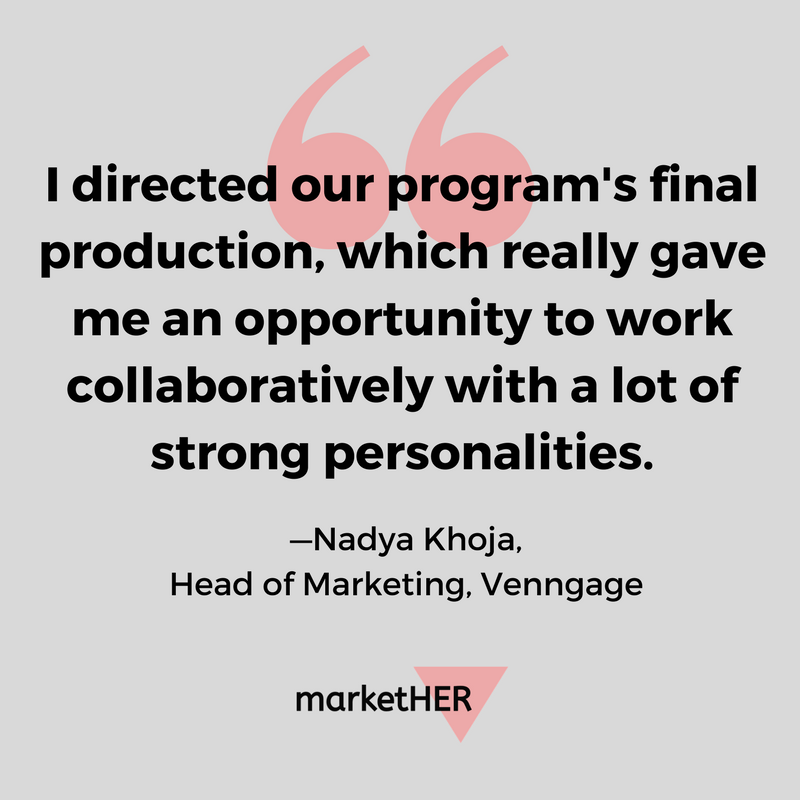 A few different things, but I've been lucky to work at Venngage, in an environment where women actually make up the majority of the leadership team. More specifically, women of different ethnicities and races. I've never felt any form of negativity from my team or my CEO because of my gender or race. It's more so when I meet other people at conferences or in other workplaces that I get a first-hand feeling of a lack of "expertise" in my field because of either my age or gender. How do you secure buy-in for your ideas? One of my biggest struggles has been securing buy-in—and that applies to work or networking. What I've learned is, if someone doesn't believe in you or want to buy into your idea, do it anyway on your own with a personal project and prove that it works. Then just present the results, and it will seem like an obvious route to pursue. Nothing. I learn from every experience—good and bad. Being able to work with a team of enthusiastic and kind people who are all working towards creating and marketing a better product. It's not always what you know that's important when first entering a new industry. It's a willingness and ability to learn more—no matter what.